From Flanders Today: A project at Ghent University (UGent) makes it possible for anyone to create a robot capable of interacting with humans using speech and facial expressions. Opsoro, short for Open Platform for Social Robots, is planning to launch a start-up in the near future. “Today, constructing social robots requires a lot of time and money, but we will provide an open-access option that will allow everyone to experiment with the technology,” says one of the founders, Jelle Saldien, a professor of engineering at UGent’s Kortrijk campus. For his PhD at the Free University of Brussels (VUB), Saldien was involved in the development of the social robot Probo. A world-renowned “huggable robot” with bright green fur, Probo communicates with children through speech, facial expressions and a video screen in its belly. The robot is used in studies that explore how humans, and especially children, interact with machines. Opsoro isn’t available yet, but the robots are available for pre-order on the website, which also contains a step-by-step guide to putting them together. 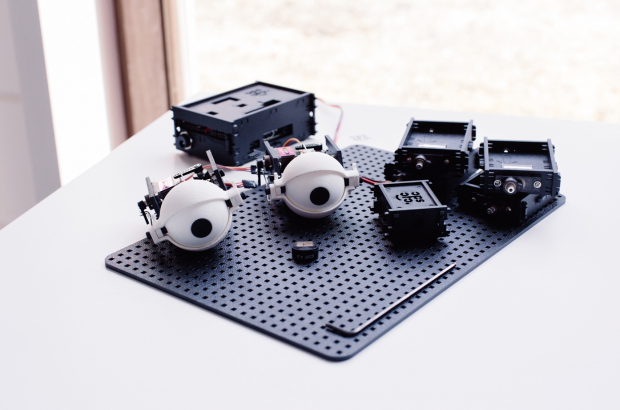 There are three options: a starter kit with all the technology required to create a simple robot; an expansion pack with extra features like camera and motion sensors; and software to build your own robot from scratch. The last option is meant for people who know enough about the technology to create their own modules with 3D printing and laser cutting. Programming the robot to speak or raise its eyebrows, for example, is also relatively easy thanks to the apps provided on the website. Before you put all the pieces together, you can first create the robot in an online simulator. Saldien says they’ve tried to keep the prices low to reach as many people as possible. The starter kit costs €298, while the expansion pack is an additional €188. The basic kit for DIY users is only €68. The website also includes forums where users can exchange their experiences, making it easier to create robots for different targets groups, like children or professionals, explains Saldien. The platform already includes instructions on how to build the social robot Ono, intended for communicating with children. Ono is being developed by UGent researcher Cesar Vandevelde. By giving young people access to a platform where they can experiment with the technology, Saldien hopes they will discover the robots’ practical applications and not see them as complicated consumer products that can only be developed by large corporations. “The social robots’ ability to communicate with us also makes the technology seem more ‘human’,” he adds. The use of social robots has already been tested in therapy setting. The robots can, for example, help psychologists teach autistic children about emotions and social skills, such as greetings and facial expressions, or aid speech therapists in stimulating language development. “Through our platform, therapists can share experiences with colleagues to spread information about how useful social robots can be,” says Saldien.